If you ever visit New York City, try to remember to never pick a fight, steal an item, or look for a virgin! After all, fighting is bad, stealing is illegal, and there aren’t any virgins living in the city! What? You don’t believe me? Then just ask Charles Soule, Mike Henderson, and Marvel Comics in July, 2018. Allegedly. Wink-Wink! 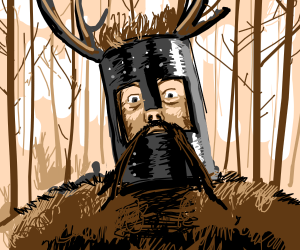 TO QUOTE The Knights who say Ni: ‘Ni’! Ever since they were first formed during the 15th century, The Order of the Dragon, a notable religious order, have tried to do everything in their power to defend and protect the world from vile vampires, Zionist zombies, evil elves, malicious monsters, plus anything else considered evil, vile, and mean. 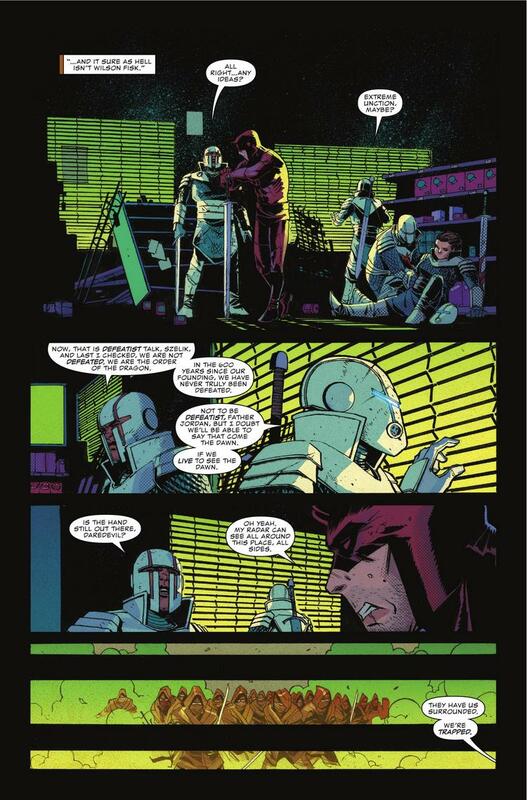 Which, in many ways, explains why they’ve come to New York City, right here, right now, so they can save the population from The Hands nefarious attacks, be it towards Matt Murdock himself, or anyone else who’s been poisoned by their deadly toxins. Part One) HELL YES: It may come as no surprise when I say that the subject of religion can sometimes be a difficult subject to discuss. After all, some people prefer one religion, other people prefer another religion, and unfortunately, this leaves most of them feeling hesitant, unsure, and timid to either declare their own faith or comment on someone else’s! But as far as I’m concerned, ha! I couldn’t give a toss! My personal credo is that you should try to be a good, honest person, regardless of where you live, how you live, and what your status is in life. Besides, being nice costs nothing, nothing at all, and tolerance, acceptance, and understanding are all very desirable virtues to possess. You know, just like being a member of the Order of the Dragon, for instance. Or as I like to call them, the Order of Enter the Dragon, Hai-Yahhh!!! Seriously though, folks, I’ve always been intrigued by this brand of religious-organization because I like to see how they’re being depicted in different forms of media! I mean, is this group of bible-bashing G.I. Joe's a bunch of good guys? (which seems to be the case) A bunch of bad guys? (which is always a possibility) Or are they going to walk the fine line between good and evil? (which could go either way) Well, let’s face it, don’t you find their sudden appearance slightly suspicious? Just a little bit? Considering that they’ve never been in contact with ‘other heroes’ in the past! Furthermore, even though I like to think of them as being a good, helpful, and brave group, in the same breath, I’m not completely sold on the idea since they’ve shown up at the right time and at the right place! Is this just a coincidence or is this just a whim of fate? 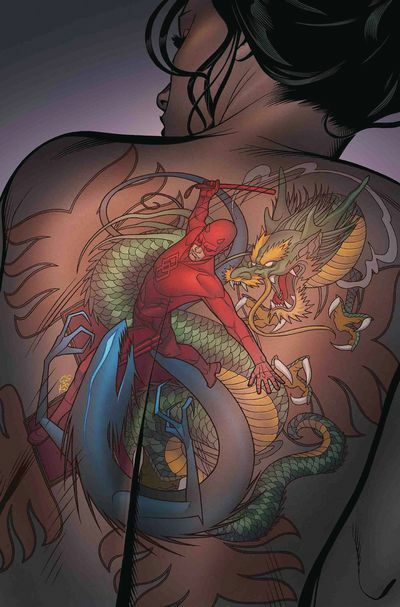 Either way, I’m still happy to see The Order of the Dragon in this story, and yes, I was genuinely excited to read their origins showcased in issue #604. That was nice. That was very nice. As I find a protagonist's back-story always adds a modicum of weight to the proceedings, no matter how conceptual. Now, from the looks of it, I presume they were based on the Knights Templar, another religious order (Catholic in origin), who were chivalrous in nature and defended the planet during the 12th, 13th, and 14th century (Thanks Google). Also, another trait they seemingly share; would have to be how they like to hide in plain sight and try to manipulate and control certain situations for the good of humankind (allegedly). Sometimes they can do this by using physical means, and at other times I presume they can do this by using political means. Yet, in each instance, their intention is to further a cause, highlight an agenda, or generally safeguard a set of rules and principles they try to abide by. That said, however, one of the main reasons why I think the Order of the Dragon may be a righteous Order — and no, not like the Knights Templar — is because I really, really, really like Father Jordan. He’s stoic. He’s honest. He’s smart. And most importantly of them all, he doesn’t seem to mince his own words. No. Not to anybody! What do you think, dear reader? Are they good or are they bad, and will we find this out sometime soon? Let me know in the comment section below. Part Two) SIMPLE AND PRECISE: In my most humble opinion a story doesn’t have to be overly complicated or highly detailed for it to be a great, great, story. More often than not simplicity and charm are two key components when it comes down to constructing an amazing adventure. Simplicity, because it helps the reader follow the plot; and charm, because personable characters are always entertaining. 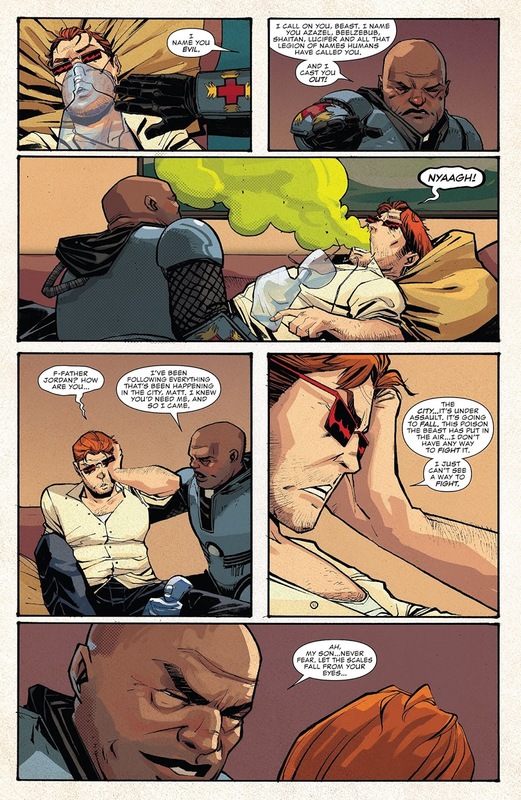 Case in point, during issue 604, there was a very funny scene where Matt Murdock comments on Father Jordan's previous declaration of being a member of the Order of the Dragon. ‘I thought that was a name you gave to ‘poker night'’, said Matt, only for Jordan to then respond by saying, ‘no’, along with a montage styled explanation detailing the history behind his religious organization. Now, to me, personally, this example demonstrates how you can convey charm and simplicity in a clear and jovial fashion. Firstly, we know that Matt is a wise guy because of what he says as well as the way he says it. Secondly, we know that Matt has met Father Jordan before because of the aforementioned comment. And thirdly, we know that Jordan is an educated and dedicated individual because of previously established reasons. See? Charm and simplicity equal good old-fashioned storytelling. Fortunately enough, there were a number of other great scenes also featured throughout these two issues, scenes which were equally as charming and as funny. This includes Foggy's confrontation with Wilson (Ha! That was a hoot), Sam and The Police’s final face off with The Hand (Ohhh! That was intense), the horse riding scene (Wow! That was stomping), everything depicted during the aftermath of issue 605 (Wink-wink! That was amazing), and of course, all of those great, great, scenes where plot, action, and exposition, magically merged together like music and lyrics. Part Three) WHO IS THE BEAST: That said, however, the one thing I wasn’t too keen on would have to be Daredevils final confrontation with The Beast. 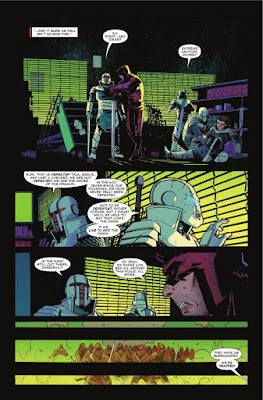 Well, without giving too much away, I felt that it ended rather abruptly, too abruptly if truth be told, almost as if Charles Soule was ordered to end this storyline before it dragged on, and on, and on. Did it though? Drag on I mean! Because personally, I don’t think it did. With all due respect, I would have liked to have seen at least one more episode, possibly two, just so The Beast could convey his motivations and give himself some much-needed depth. After all, he did come across as a flat, grotesque, two-dimensional monster, whose only motive was to get his revenge, blah-blah-blah, confront an old adversary, yadda-yadda-yadda, and, you know, take over the world... zzzzzz. I mean, seriously, what do we truly know about this mystical villain? Well, apart from him being mystical, a villain, plus some sort of de facto leader associated with a group of disposable ninjas?! Alright, so we know that he’s evil, so I suppose that’s something. Plus we also know that he has the power to corrupt souls, restore injuries, and poison, possess, and take down whoever he sees fit! But that said, where did he get his powers from and why is he so, so evil? Is he evil just because he’s a devil and presumably from hell? And if that is the case, how did he first come to Earth? How did he get together with The Hand? Plus what was he doing in hell to begin with? Sorry, I know that I’m asking a lot of rhetorical questions, dear reader. It’s just that sometimes it gets on my nerves when we’re presented with a cardboard cut-out of a villain, with no back-story, no depth, and nothing for us to connect to. Besides, the Order of the Dragon was given an origin story, so why couldn’t The Beast have one as well? 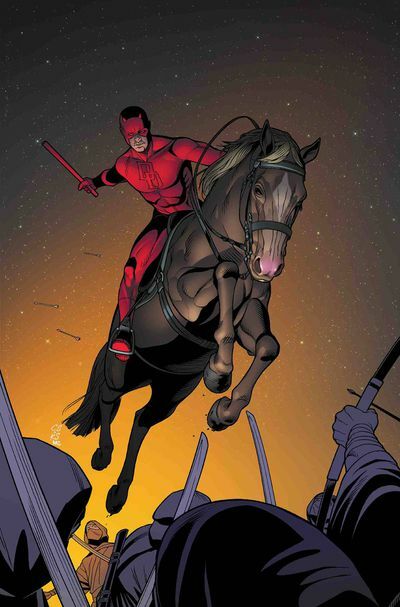 Anyway, that aside, overall these two episodes of Daredevil were a pretty solid read. 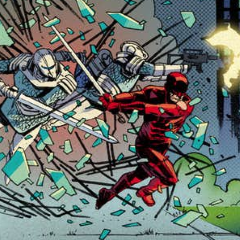 Charles Soule’s story was both exciting and adventurous, Mike Henderson’s artwork was clean, crisp, and very dynamic to follow, and all in all, yeah, the future is looking good for this book, really good, and I can’t wait to see what Matt will do next with his battle against Fisk! Fingers crossed, it’ll be good. Either directly, or indirectly, these two episodes represent a strange fight between the forces of heaven and the forces of hell. So, with that said, how about I musically match them up with the following song performed by Black Sabbath: ‘Heaven and Hell’. I’m so sorry about this, folks, but whenever I see a Knight, I always, always, always, think about the Knights who say ‘Ni’. Therefore, the comparison has been made, and may God have mercy on my soul. Ni! 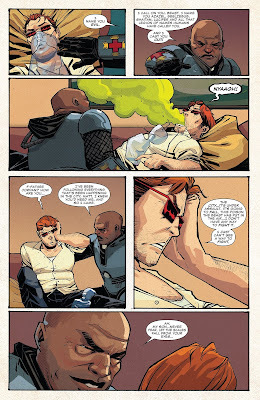 Matt dies so Foggy Nelson feels obligated to take on his Daredevil persona. Wilson Fisk dies and becomes the new Beast. The Order of the Dragon comes clean and tells Matt that they’re associated with the Hand. Matt kills The Beast and figures out that Wilson rigged the election. The Beast kills Father Jordan. When all is said and done, Sam joins the Order of the Dragon. The Hand buys a pair of gloves. Matt ends his political career.